Award of the American academy of cinematographic arts and sciences, from 1940th known as " Oscar", - American film award created in 1929 and traditionally handed to the figures of cinematographic art for their contribution to creation of movies. Paddy Chayefsky: ...for the propagation of their own personal political propaganda. 50 Glorious Years! Star Packed Show Features Many Film Greats! SLAP! The sound of a baby crying. 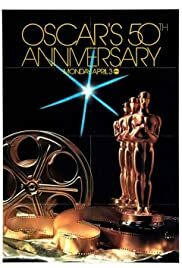 And so begins Oscar's Fiftieth Anniversary Show, a jam packed star-studded evening that closed the door on the Academy's first half century and laid the seeds for it's next half. After Bob Hope's schtick (this was Bob's last year as solo host), John Travolta commences the first scandal of the night—Best Supporting Actress. Without rehashing her speech, I can only say that Vanessa Redgrave WAS great in 'Julia' and certainly the best of the five nominees. Mickey Mouse briefly crosses paths with C-3PO and R2D2 of 'Star Wars' before presenting an award with future 2 time winner Jodie Foster. did not pursue this embarrassment. 'Star Wars' and a team of men rush to the stage. An overwhelmed Joan points to the Oscars and says "Everybody grab one". After each one speaks, the orchestra begins wrap up music only to be stopped by another making a speech (you suddenly realize why there are time constraints!). Joan, halfway offstage, rushes back to wait for the last to speak. When they finish, the men rush off and leave Joan in the dust! Alone, she follows them offstage. The Fonz"), Eva Marie Saint & Jack Valenti (his first show since being shut out the year before). Hope introduces Michael Caine and a luminous Maggie Smith. The latter looks terrific with her hair and gown almost matching her character in 'California Suite' which would win her a 2nd Oscar the next year. Maggie's beauty and attitude make one forget that a) the winner, Jason Robards was not there (Peter Firth was the only nominee in attendance) and b) the previous year's winner, Beatrice Straight who was in the house, was not asked to present. Another high point: Natalie Wood presents the Costume Award and introduces an array of film greats who model the outfits. Cyd Charisse, Stockard Channing, Camilla Sparv, Pricilla Barnes, Michelle Lee, Susan George, Deborah Raffin, Karen Black and Eleanor Parker are the models. Bette Davis returns to give the Hersholt award to Charlton Heston while Olivia DeHavilland elicits titters when she honors Margaret Booth who "has run a lot of celluloid through her moviola." Fred Astaire makes his final Oscar appearance to a standing ovation while Cicely Tyson (WHAT is that thing in her hair?) & King Vidor crown the absent Woody Allen Best Director. The first Best Actress, Janet Gaynor, appears and recounts HER evening 50 years before. Sylvester Stallone appears (much more refined than the previous year!) to crown Best Actor. Let's dispel an urban legend. Contrary to popular belief, Richard Burton was not "out of his seat and moving toward the stage ". When Richard Dreyfuss' name was read. Rather, he smiled and applauded as most people do (exceptions. Sally Kirkland, Ellen Burstyn, Sylvia Miles). The evening ends as it has many many times in the past 30 years (including the two years just past) with Jack Nicholson presenting Best Picture to Annie Hall. Finally, Bob Hope sends get well wishes to John Wayne, recently diagnosed with a recurrence of cancer. High Points: Too many to mention. So Many Stars. Young and Old. Low Points: Too few close-ups on the former winners and costume models.